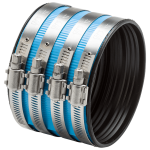 Flexible drain and trap connector for Tubular pipe to Tubular pipe. Ideal for new installations, repairs and alterations. No gluing, threading or soldering needed. For non-pressure, gravity flow applications only. Recommended for above ground installations. Easy to install and reuse. Multiple sizes from 1.25” to 1.5”. Synthetic rubbers permit considerable distortion withstanding tension and compression. 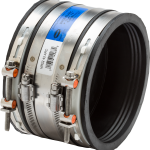 More pliable, easier to install in cold weather applications than elastomeric PVC gaskets. Molded synthetic rubber bushing is strong and resilient to fungus growth. 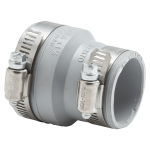 Multiple connections: Tubular to Tubular, Tubular to Plastic, Tubular to drain pipe, Copper to drain pipe, or Plastic to drain pipe. Certified Cradle to Cradle™ - Manufactured within a 5-Point Continual Improvement process: material health, material reutilization, renewable energy and carbon management, water stewardship, and social fairness.